Il bere, which means “to drink” in Italian, is a concept that was born during a recent trip through Northern Italy where mark your drink became a common theme and helped create the concept of Il bere. For the creators of Il Bere, the goal was to create something original, yet classic. Il Bere has developed wine and drink charms that sit beautifully on the side or the base of a glass. These charms provide a unique way to “Mark Your Drink” on wine glasses, cocktail glasses, water glasses, champagne flutes, beer mugs and even plastic cups. Il Bere wine charms incorporate small magnets to securely hold the charms in place. The charms can be attached to the side or on the footed base of a glass and they don’t affect the taste of the beverage in the glass. The magnets are safe, and won’t come loose unless the charm is removed from the outside of the glass. It’s as easy as dropping the magnet into the glass and holding the charm to the outside or base of the glass until the two magnets attract. Slide the charm to the desired position and pour the beverage. To clean, wipe with a damp cloth and do not immerse in water. Not intended for children under 12 years of age due to a choking hazard. Also, individuals with pacemakers or internal medical devices should not handle the magnets. Each set of 4 charms comes with a storage box complete with directions. 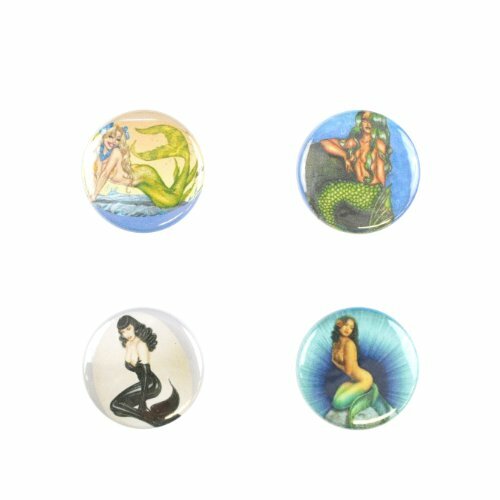 Mermaids may not be real but these beautiful ladies are sure to make any mermaid-believer happy! These charms are a great gift or party accessory. If you have any questions about this product by Il Bere, contact us by completing and submitting the form below. If you are looking for a specif part number, please include it with your message.